A once-a-year scrub-down will extend the life of a concrete patio, a wood deck, or a stone walkway—and will make your outdoor zone gleam. Once the surface is wet, everything sticks. Anything you can catch with a broom while it’s dry is something that you won’t have to peel up later. Hose down plants around your patio or deck, especially if you’re growing vegetables. Coating the garden with water helps soap to slide off. If you want to be extra careful, you can drape some light plastic drop cloths over sensitive zones. 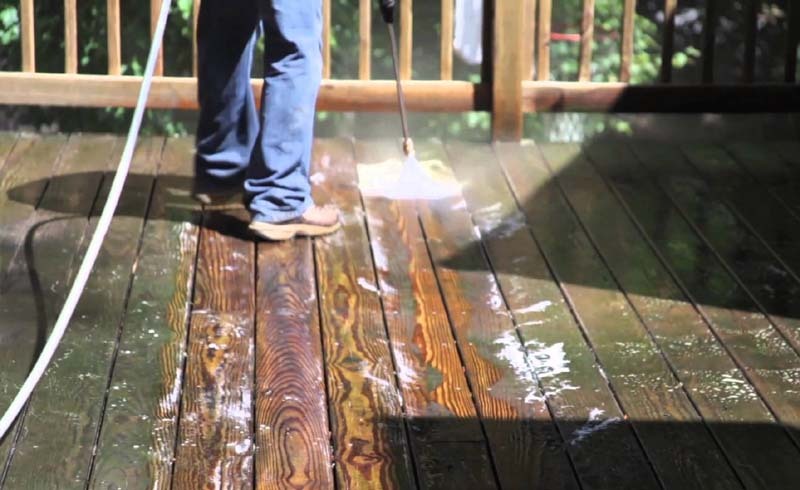 Tackling stains can be challenging because not all decks are made from the same material. From concrete to wood, find out how to treat stains properly. For wood, use a cleaner like Deckscapes Deck Wash. On concrete, you can use a multipurpose solution, such as Benjamin Moore Clean 318. Dilute according to the directions, then use a stiff push broom that’s small enough to dip into a bucket. Get your surface wet and sudsy and put some muscle into it. Then hose down. For stone, fill a large bucket with warm water and add two or three squirts of dish soap. Apply with a nylon push broom. (Don’t use wire bristles on stone—they can scratch.) Scrub until sudsy, then rinse well. When you’re all done, a generous spritz of white vinegar in the spaces between the stones (or in cracks in the concrete) will temporarily discourage the growth of weeds. Note: If you want to experiment with a concrete- or stone-specific detergent, read the labels carefully. Acid-based cleaners, especially muriatic or hydrochloric acid, may burn concrete or damage its top layer, and they can discolor stone. 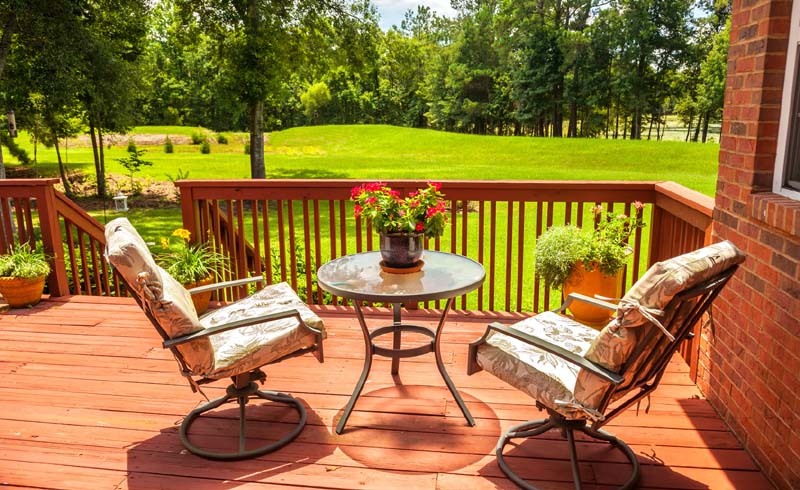 If you’ve rented a pressure washer to clean your house, you may be tempted to use it on the deck or fence. While it can be OK for some surfaces, it can also hurt grout between stones and turn softer wood to pulp. So check with your rental place before you spray.